THERE REALLY ISN'T A MIRACLE CURE FOR ANYTHING, for miracles are just amazing happenings that come about from application of truths lodged somewhere in the realm of the yet-unexplained laws of the universe. However, it seems like a Tiiracle when someone gently rubs a bit of castor oil over and over on a skin cancer of the ear, for instance, and the cancer just gradually disappears. It might take days or weeks or a few months, but it just doesn't make good sense. For who would attribute miraculous powers to a substance as lowly as castor oil? Yet this has happened, and the owner of the lesion on the ear feels as if he or she has discovered a new world. It's really a miracle to that individual. 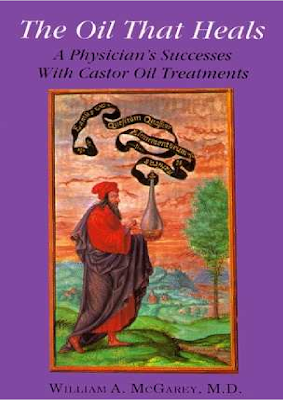 This book is not about miracles, but it certainly has its foundation in the kind of healing that takes place when castor oil is used on—and sometimes in—the human body. Castor oil has a specific kind of an effect which some have called vibratory, when it is used therapeutically. For the present time, however, it probably is proper to say that the method of healing by using this oil is still undetermined. The results, however, have been apparent—not only in my experience, but in ancient times, as well as earlier in this century as reported in the medical literatur.